Minneapolis protest against U.S. war in Afghanistan | Fight Back! 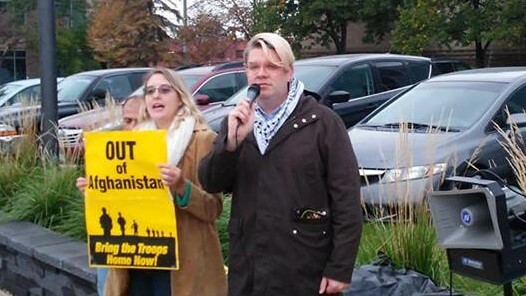 Minneapolis, MN - Over 30 people joined a Minneapolis protest on October 5 to mark 17 years of the U.S. war in Afghanistan. The protest, organized under the call of Stop the U.S. War in Afghanistan, was held in front of the offices of Minnesota U.S. Senator Amy Klobuchar. The event was initiated by Minnesota Peace Action Coalition. Jennie Eisert, a member of the Anti-War Committee, spoke at the rally, saying in part, "Afghanistan, along with Iraq, and the other wars that the U.S. government has endlessly inflicted on the world has shaped an entire generation. A child, born on this date in 2001, is now old enough to fight in Afghanistan and has grown up in an environment without privacy rights, in a time that has ‘normalized’ Islamophobia, hate and endless U.S. wars and occupation." Eisert went on to say, "What have been the costs of this endless war and occupation in Afghanistan? The U.S. government and other ‘official’ Western sources admit to at least 32,000 Afghan civilians being killed and another 30,000 being wounded directly related to the U.S. invasion. Another source, The Cost of War Project, more credibly claims that the U.S. invasion is responsible for at least ten times that number of deaths, 360,000 people killed in Afghanistan because of the U.S. invasion." Organizers announced plans for a Minneapolis protest to be held Sunday, October 21 in solidarity with the Women's March on the Pentagon.